I don't do a lot of storage posts for the good reason that I'm not the most organised person and also I'm not living alone, so I have to deal with two other person's clutter as well. I quite like storage posts and ides though, so today i'm going to share with you how I store my nail polishes, and my manicure accessories. 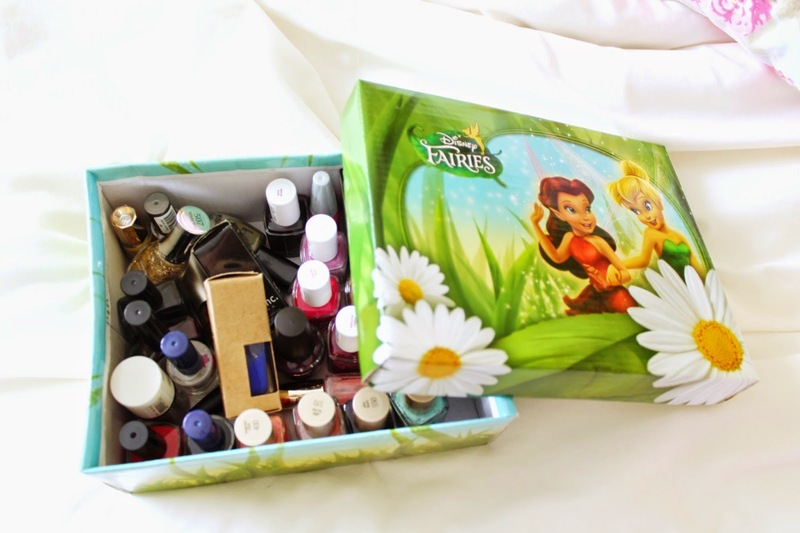 The "bulk" of my nail polishes is store in my closet, in thie Fairies shoebox. Nail polishes, like perfumes, are sensitive to light and warm and moit environment. That's why I like to store mine in a dark place. I also avoid to keep them in the bathroom, because of the humidity. For the accessories (nail file, remover, separator, stamp plates, etc.) they are in another box. This one was a gift from my aunt but you can find similar cute storage box at Target, Winners, TK Maxx. This is pretty much a "junk" box, everything that is nail related that doesn't fit anywhere else go there. As you can see, I have some nail polishes in there. I'm thinking of moving all my Essie into a box of their own soon! I also keep a good part in the office. The heart plate from the first picture above is from Dollarama. It contains my Nicole by OPI polishes. This container is a mushroom one that I got in October for Breast Cancer Awareness month. I like the color, so I kept it and pretty soon I found something to do with it! For some reason, my reds are in there. I think I gathered them in there for a post and then liked the idea. Then of course I had to put something thrifted in there! This is a plate/dish that I got last year from the charity shop. Those OPI polishes fit perfectly in there, and I can still see the color of each when I'm staring down at them! How do you store your polishes and makeup? Do you have any original ways to put away your belongings?